Following Jesus is a journey that requires us to do God's will always in order for us to be happy. Our faith will grow when we remain steadfast and hold unto God no matter the challenges we may face in life. If we stay with God till the end we will be rewarded for our loyalty because God can never fail and He wants us to keep growing in our faith so that we can keep showing the words who He is. Of what use is our faith if it does not grow. It cannot grow if it is not tested. We must be prepared always knowing that situations that will test our faith will come, then we stay at alert and be conscious always to hold unto God and not disappoint Him when the trials, persecution and tests come. Our faith will grow when we do good and stay close to Jesus who will nourish us always with His word. Therefore, learn to trust God at all times and strive to remain steadfast in following Him so that when He comes, you will receive your reward. Good morning dearest one. Smile as you do your work and do have a fantastic day and new month ahead. 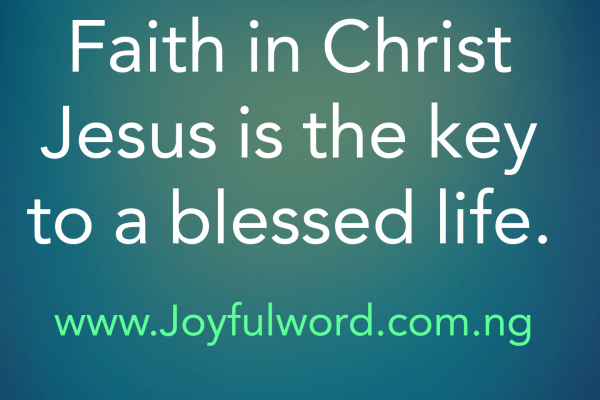 May Jesus give you grace to keep your faith alive always. Amen. And May the Almighty God bless you: the Father and the Son and the Holy Spirit. Amen. *Watch-Word:* From the Lord comes the salvation of the just!